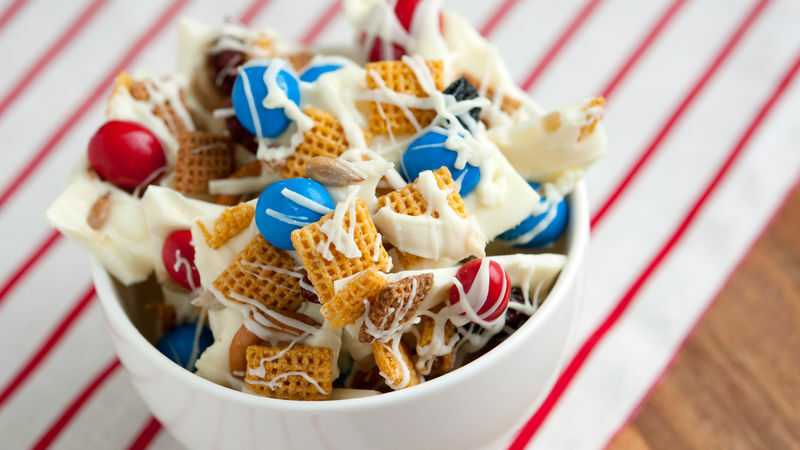 In a large bowl, combine the snack mix, blueberries, cranberries, and sunflower seeds. Place the white chocolate chips into a medium, microwave-safe bowl. Melt in the microwave on High for 60-90 seconds then stir. Melt for an additional 30-60 seconds, if needed. Drizzle the melted chocolate over the snack mix, and stir until well coated. Turn the mix out onto a large piece of wax paper, sprinkle with blue and red candies, then allow the white chocolate to stand at room temperature for about 1 hour to harden. To serve, break the mix up into large chunks. If you like trail mix, you’re going to love this candy bark! It’s full of the tart, chewy flavor of dried fruit, the crunch of sunflowers, and the snack-worthy bite of Chex Mix™ snack mix. Delish!